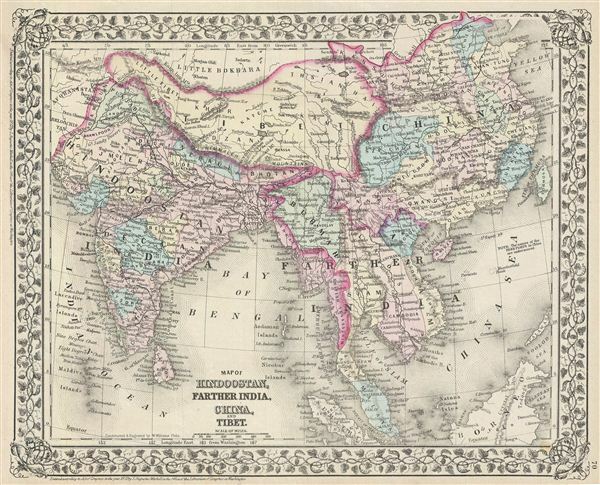 A beautiful example of the legendary map publisher Samuel Augustus Mitchell Jr.'s 1872 map of India, Southeast Asia, Tibet and China. Features the entire sub-continent as well as all of Southeast Asia. Includes the modern day nations of India, Pakistan, Bangladesh, Nepal, Thailand, Vietnam, Cambodia, Laos, Burma, and Malaysia, Tibet and China. Identifies both the Great Wall and the Grand Canal in China. Taiwan or Formosa is mapped vaguely, representing the poor knowledge of the region prior to the Japanese invasion and subsequent survey work in 1895. As this map was drawn, Imperial China wilted under the weak Qing Dynasty while the governance of India was under the British Raj. Tibet is here rendered separate country from China, with Ladakh within the Tibetan border. This is unusual enough to merit some discussion as knowledge of the region was quite limited in Mitchell's day. At the time of its publication Tibet was a closed country owing a nominal allegiance to Qing China but without direct oversight. Qing China was involved in a series of internal uprisings and rebellions throughout the 19th century. Most of the cartographic information on this map dates to clandestine British surveys of Tibet instigated in the late 17th century in the form of itinerant Indian surveyors disguised as pilgrims. The tale of their adventurous mapping of Tibet is a wonderful read and highly recommended. In any case the border lines defined on most maps of the period, including most other Mitchell maps, follow the model established by John Winterbotham in An Historical, Geographical and Philosophical View of the Chinese empire which includes Tibet as part of Chinese Tartary – those non-Chinese states to the west and east of the China proper owing, to varying degrees, allegiance to China. Winterbotham drew his distinctions from some of the old borders created following the breakup of the Mongol empire. Under Kublai Kahn, who ruled from China as a mostly Chinese emperor, Tibet was, though not China, clearly under Chinese vs. Central Asian Mongol control. Other maps, leaning toward the Russian perspective, attach Tibet to Independent Tartary, an even less known collection of independent states located in Central Asia, again associated with the heirs of Ogedei Kahn. At the time both heirs, Kublai Kahn and Ariq Boke, claimed the title of Great Kahn, with Ariq Boke entrenched in the traditional Central Asian capital of the Mongol empire at Karakorum and Kublai based in Beijing. In time Kublai won, but his true power never extended far beyond the territories directly surrounding China, that is Chinese Tartary. The empire of Ariq Boke based at Karakorum eventually just fell apart into a number of warring factions. By the 19th century both the British and the Russians were keen on taking advantage of the weak state of the Chinese empire to assert more control over Central Asia. The Russians were probing this region as early as the 1700s while the British began incursions from India in the late 1700s and early 19th century. Now, as to this map, earlier and later Mitchell maps, as well as broader Mitchell maps from the same atlas do to use the same hand color scheme regarding Tibet. Most attach it to Chinese Tartary leaving the northern border of Tibet uncolored. No new knowledge of Tibet appeared during these years that may have influenced Mitchell. Thus, that in two or three editions of his atlas Mitchell chose to represent Tibet as an independent state on this particular plate can be attributed to a number of possibilities. A) Carto-advocacy for a British takeover the region (most of his information is in fact British in origins as Mitchell was not a cartographer as much as a publisher). B) erroneous color work (the color is the only significant cartographic difference from earlier plates).